Hey guys! 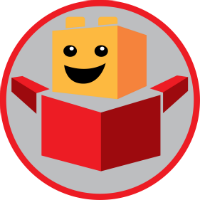 It’s VaderFan2187 here with my first post on the new Brick Pals site! Today I’m taking a look at all the new LEGO Overwatch minifigures from the new sets, and I’ll be expressing my thoughts on them. 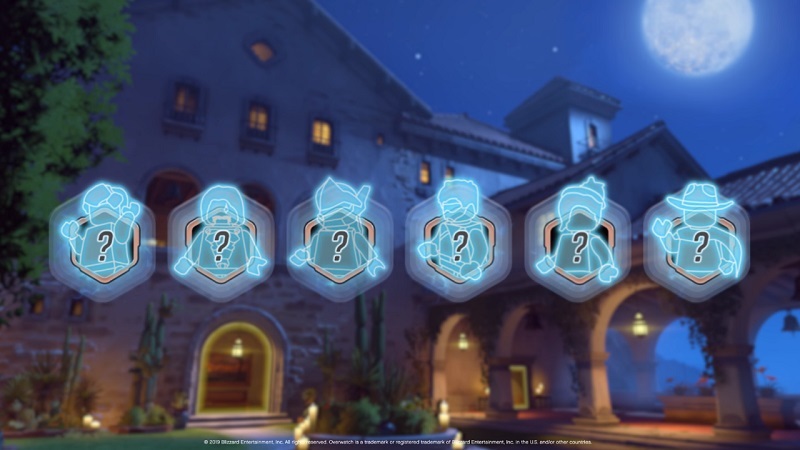 There are currently seven Overwatch sets that have been revealed. One has already been sold as a Blizzard Exclusive. Out of the seven sets, only five of them have minifigures, which amounts to fourteen minifigures in total so far. 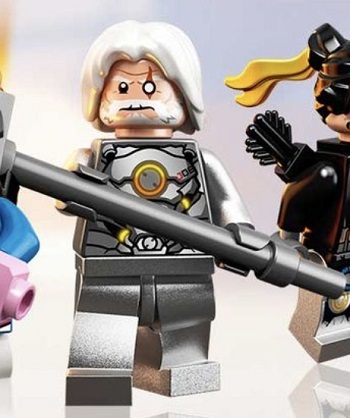 Let’s check out these upcoming LEGO Overwatch minifigures and characters! First up we have Tracer. If you ask me, she’s one of the more iconic characters from the game. Her minifigure is exclusive to the smallest set in the wave, 75970. 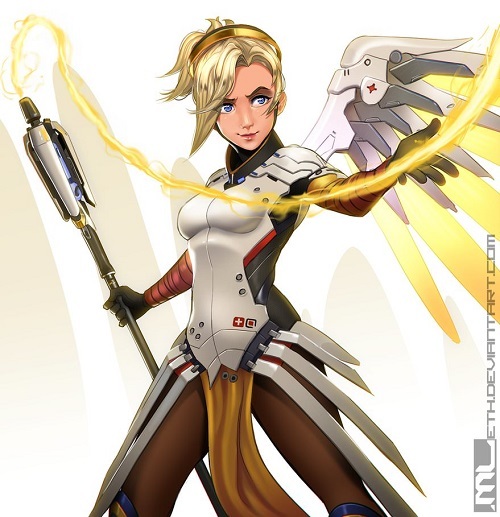 She wears her dark tan and orange uniform, which I think looks pretty accurate to her in-game costume shown below. The printing is nothing remarkable but it is good enough if you ask me. She has a light flesh-colored face with a printed orange visor and a gentle smiling expression. I’m not too sure if she has an alternate face or not. Her hairpiece is a new mold, depicting a spiky dark brown hairstyle. 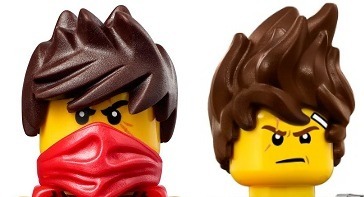 I think it looks good but I am surprised that LEGO chose to make a new mold instead of using Kai’s hair, whether it be from the original Ninjago or the LEGO Ninjago Movie. 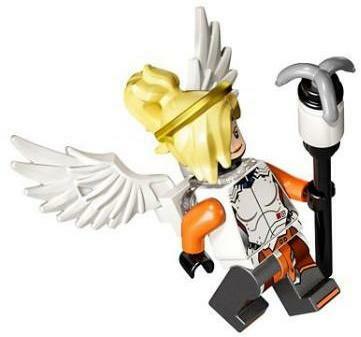 Nonetheless, I think she is a pretty good LEGO Overwatch minifigure. She comes with two white guns, which are new molds too. 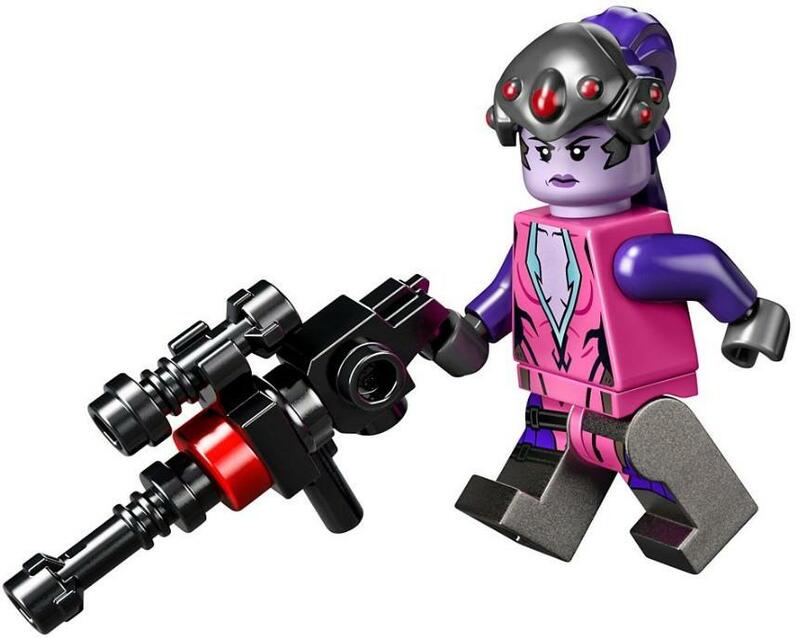 The other minifigure in set 75970 with Tracer is called Widowmaker. She has purple skin and wears a pink and grey outfit. 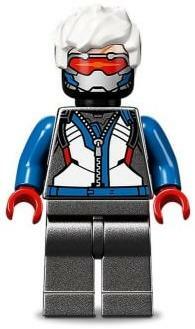 However, the most noticeable part of her minifigure (to me at least) is her headgear piece. It’s gunmetal grey and purple along with some red dots, and looks very striking. Her head piece is lavender-colored and has an angry sneer printed on it. Her pink torso has printing on it which seems pretty accurate to the in-game outfit. Interestingly, she has gunmetal grey legs with some printing on the front – presumably these represent boots, but the printing does not continue on to the sides or back so it looks kind of weird. 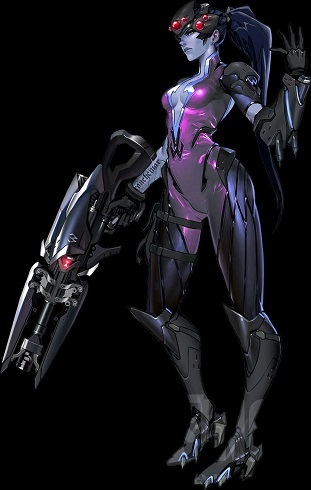 She wields a large blaster that is built around the new Overwatch gun mold in black. I think the gun looks pretty lethal! 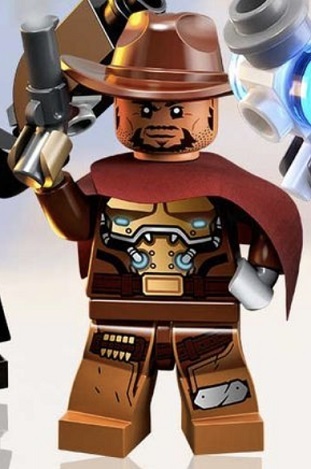 Overall, I think this minifigure is alright – the headgear is cool and the gun is sweet, but the legs look weird to me. Next up is a character called Genji, who appears in set number 75971. This character has a new silver helmet with a sleek printed lime green visor and (though it’s not visible in the image above) has a black flag-like piece sticking out the back. 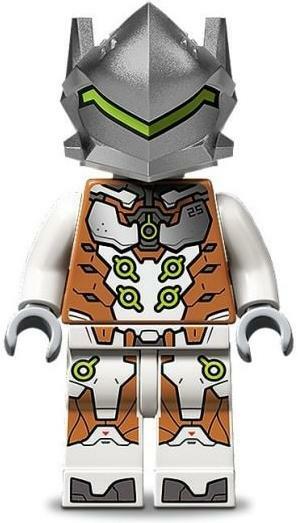 Genji wears a medium nougat and white outfit with some printed details like a silver chestplate and some lime green dots. He has a brown scabbard which can be attached at the neck, a lime green katana, and a silver shuriken. 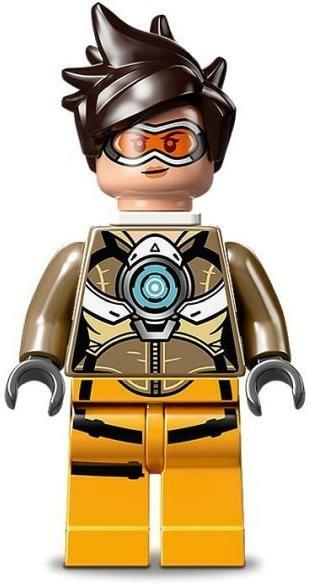 Overall, I think this LEGO Overwatch minifigure is fine. The second character in set 75971 is called Hanzo. He has a brand new hairpiece which is black but has a golden hairtie that flows off to the side in an epic way – this hairpiece will be very useful for custom traditional Eastern minifigures. He has a stern facial expression with some facial hair, which is accurate to the in-game character. His torso printing shows a partially bared chest, which continues onto his sleeveless left arm. 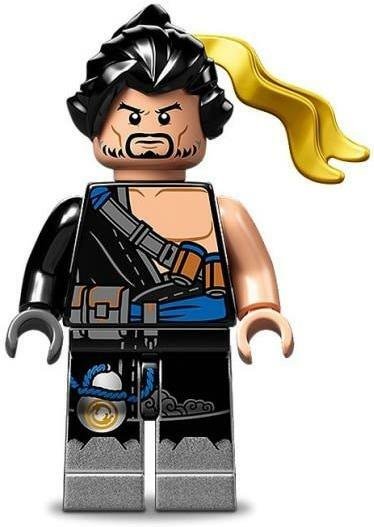 This is mostly accurate to the character’s look, but unfortunately the prominent tattoo on his chest in the game is nowhere to be seen on his minifigure. 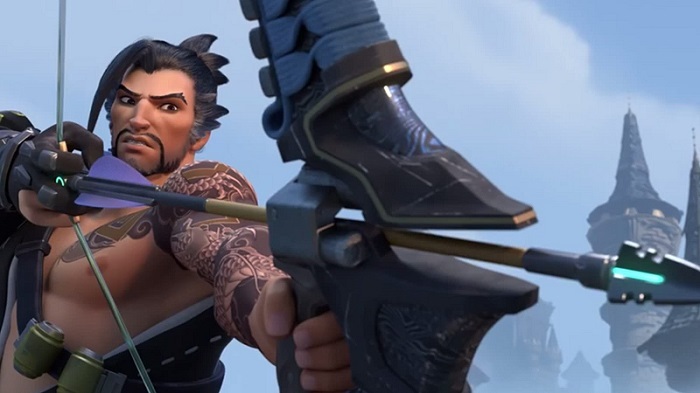 Hanzo has printing on his silver legs to represent boots, but once again he looks weird from the side. He comes with the LEGO bow in dark blue, a new color for the mold. 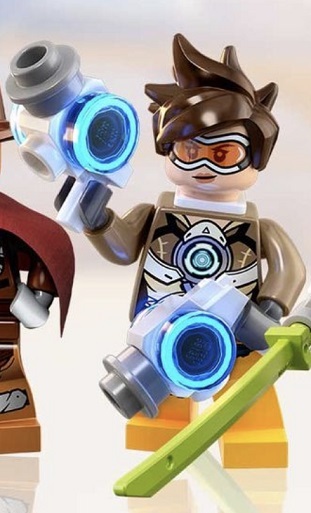 The final minifigure in the 75971 set is this guy, who apparently is based off a character in the Overwatch shorts. He has a stylish black hairpiece (that resembles Elvis Presley and Dareth from Ninjago) and a funny scared expression. 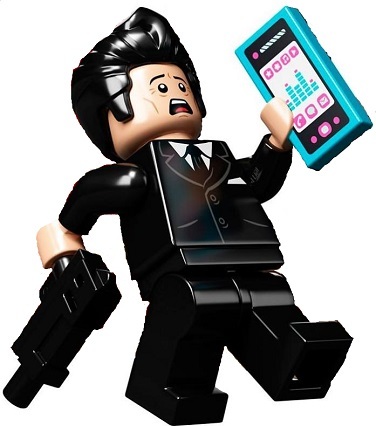 He wears a simple black suit and comes with a gun and a light blue phone piece, which is a printed 1×2 tile that first appeared in the LEGO Friends theme. He’s a pretty funny minifigure if you ask me, and is definitely not limited to just Overwatch settings. 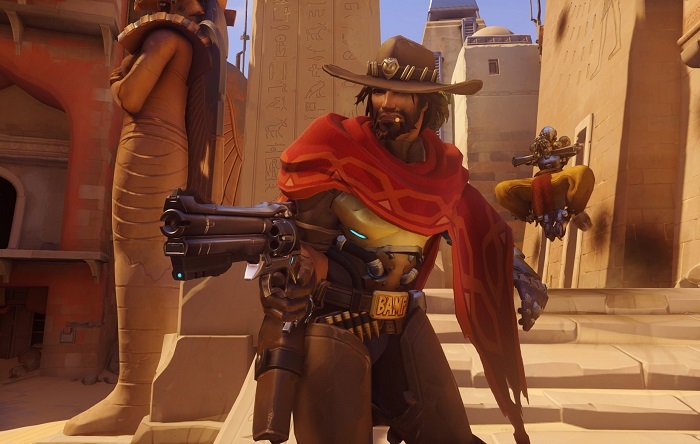 Up next is a character named McCree, who looks like he’s straight out of the Wild West. He wears a brown fedora hat (though he also has a dark brown hairpiece and has a confident smirk with some facial hair. He seems to have a new dark red cloth neck attachment to represent some sort of shoulder cape, and wears a hi-tech brown outfit. It has pretty even detail throughout, even though there aren’t any super fine details. His weapons are two existing LEGO revolver pieces. Next up is a character named Soldier 76. He has a new, short white hairpiece and a face print with his red visor and mask. His torso print shows zippered-up armor and his legs are unprinted. He comes with a bulky brick-built blaster (also built around the new Overwatch blaster mold) to represent his experimental pulse rifle. As for my thoughts on this figure? 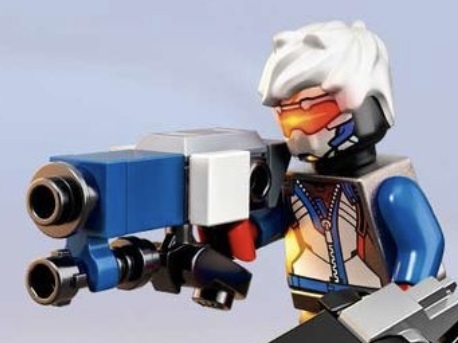 This is a decently accurate LEGO Overwatch minifigure, but I feel like he’s lacking in detail and doesn’t look anywhere as badass as the in-game character. 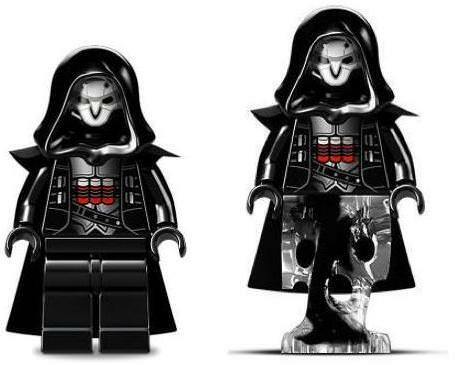 Next up is the only character to have more than one LEGO Overwatch minifigure variant – Reaper. 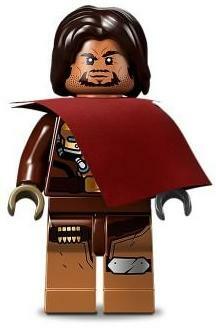 He’s a really badass-looking character in the game and I think this minifigure looks pretty accurate. He wears a black hood and seems to have a new black cape piece which is fairly narrow compared to the regular LEGO cape. His head is printed with his awesome mask design and he has accurate printed details on his torso. 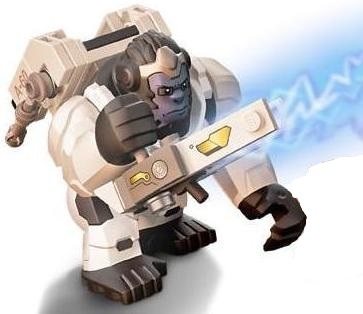 His leg piece is the only difference between the two – he has regular minifigure legs in 75972 Dorado Showdown, but has the dual-molded “ghost” leg piece in 75975 Watchpoint: Gibraltar. The ghost leg piece, which is dual-molded with black and clear plastic, is not exclusive, but I think it looks fantastic and I’m glad to see it here – though I’m a bit confused as I believe Reaper has normal legs in the game. Comment below if you have an explanation! LEGO Reaper comes with two shotguns, which are built from a light grey version of the Overwatch gun mold with some black bricks added to it. 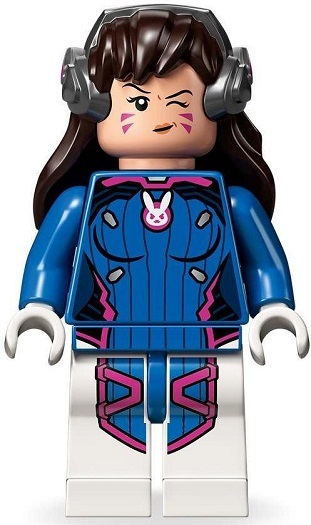 Next up is this adorable LEGO Overwatch minifigure, D.Va, appearing in the $39.99 USD set, 75973, where she gets large pink mech. She has a new hairpiece with long dark brown hair and gunmetal grey headphones, which looks pretty nice if you ask me. She has a double-sided face with a cute wink on one side and her blowing a pink bubble (presumably from bubblegum) on the other side. Her blue and white outfit is accurate to her in-game version – I especially like the little printed bunny! 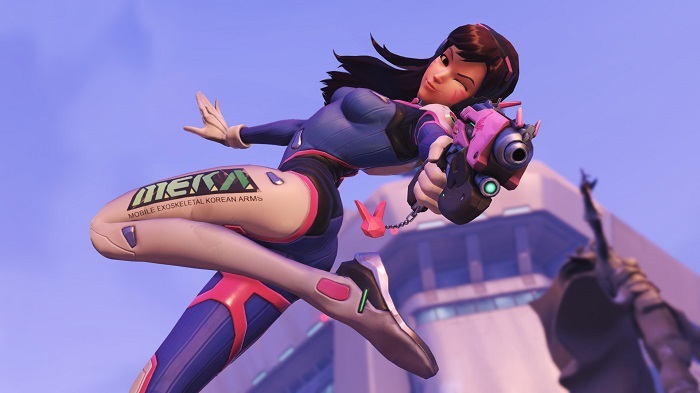 Also, she has the new Overwatch gun mold in pink as her weapon. Squaring off against D.Va in set 75973 is this character named Reinhardt. 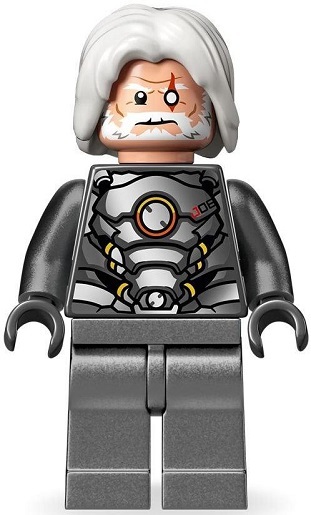 He has a white hairpiece and a new head print with one eye missing – if you ask me, this will be good for a LEGO Odin (from Marvel) or Commander Wolffe (from Star Wars): the only problem is the scarred eye is on the wrong side, but good enough for me. He has a simple gunmetal grey outfit that matches his huge mech, but he also gets a big rhino-like helmet that goes well with his mech design. His weapon is a simple staff. Next up is this character named Mercy. She seems to have an angel-inspired design, with white wings attached with a clear neck bracket and a new hair mold with blonde hair and a golden halo. She wears a white, grey, and orange outfit and comes with a staff that has a harpoon at the end. I think she’s an alright minifigure, and is fairly accurate to her in-game look. 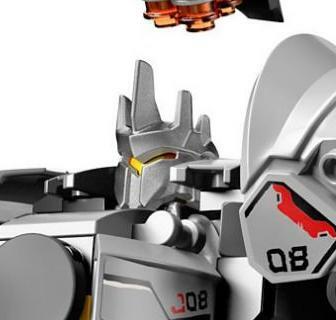 This LEGO Overwatch minifigure is exclusive to 75975 Watchpoint: Gibraltar. 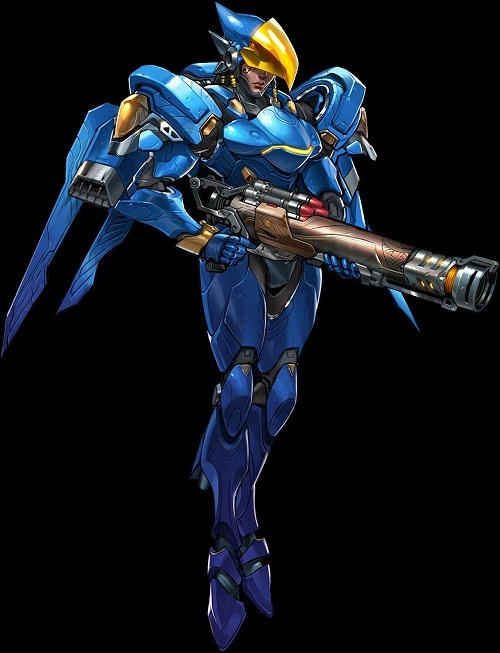 Also exclusive to set 75975 is this character named Pharah. She wears a full-blue outfit that is accurate to her design in the game. She has a new helmet mold with a gold visor – this is accurate and looks pretty nice. Her shoulder armor piece is actually not new, but is a translucent blue version of the second generation LEGO Nexo Knights shoulder armor piece. Despite being an old mold, it is actually accurate and has studs on the back to allow for her brick-built jetpack to be connected. 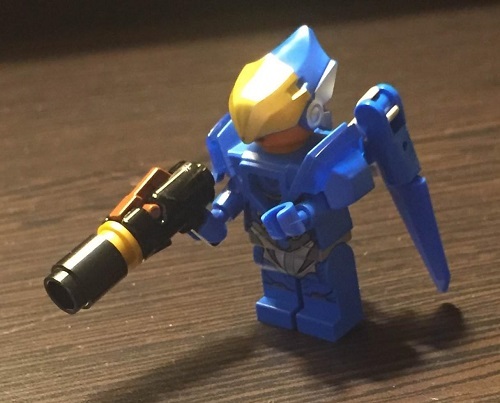 Pharah comes with a black stud shooter. Last but not least is the only bigfig in the line (at least so far), Winston. He wears a white spacesuit-like outfit and is made from several new molds. 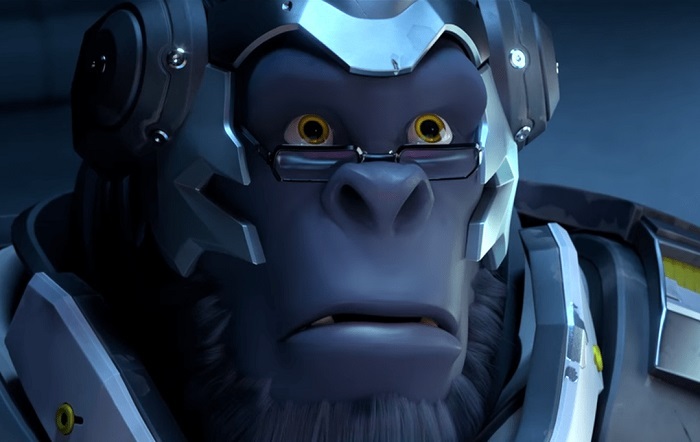 He has a sand blue face but I’m not too big a fan of the printed design – it doesn’t look very accurate to Winston in-game if you ask me and looks more like a computer technician. 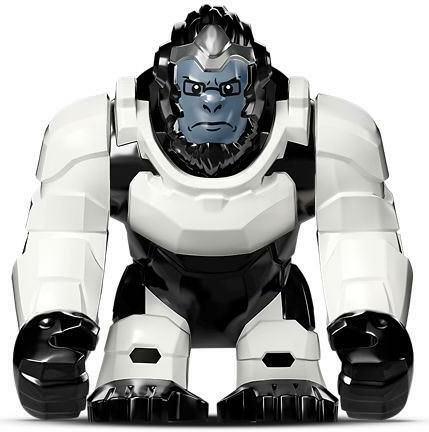 Winston has new body and arm molds, which are more squarish and resemble a hard outer suit. He still has the standard bigfig arms in black. Winston also has some added brick-built accessories. He has a big white jetpack mounted on his back, with an angular design that looks pretty cool. He also gets a big blaster with a couple of stickers. 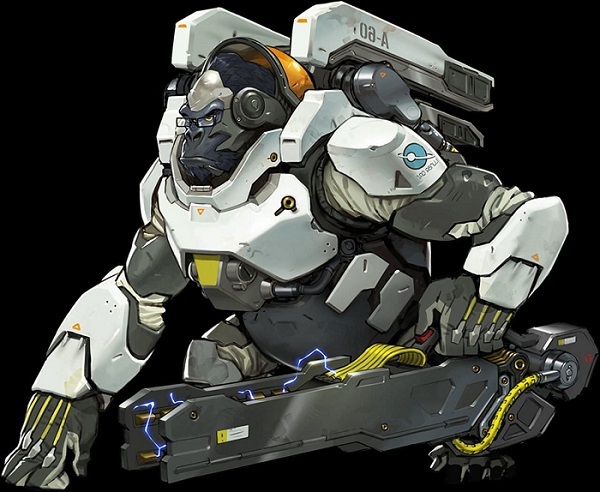 These look fairly accurate to Winston’s accessories in the game, but I feel that his gun should be more grey and less white. Well, that’s it for this post! Thanks for reading, be sure to let me know what you think of these LEGO Overwatch minifigures in the comments below! Once again, thanks for reading. 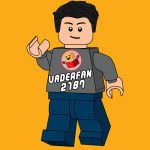 I’m VaderFan2187, see you next time on BrickPals.com! 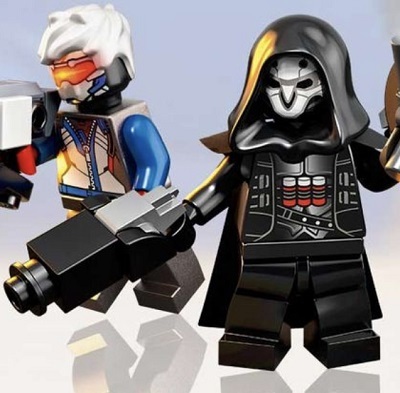 See all the LEGO Overwatch minifigures from the new sets and VaderFan2187's thoughts on them. Are they accurate to their in-game characters? Find out now. Thank you! I haven’t played the game either, but I dunno, I might try it out too! 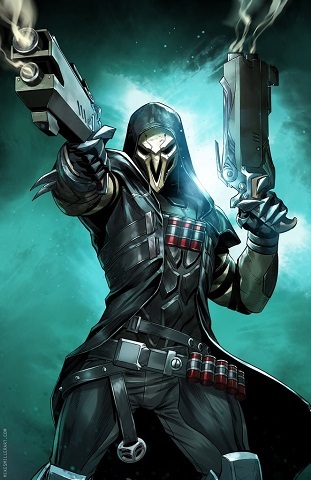 Reaper’s ghost legs are representative of his wraith form ability. Thanks for the article!